Canada is well on its way to becoming a country where knowledge and ideas, not oil or timber, are its most important resources – but there’s more work to be done before we truly become an innovation nation. 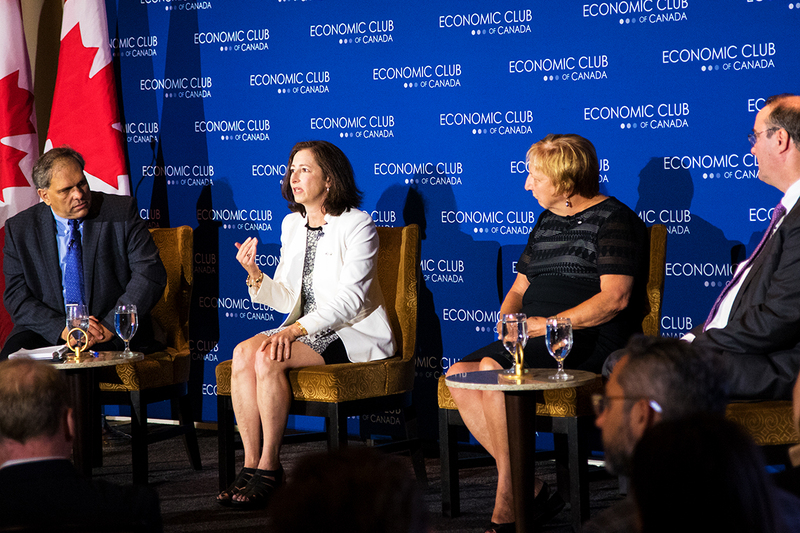 That was the message delivered by University of Toronto researcher and former Ontario chief scientist Molly Shoichet and two other post-secondary heavy hitters – Martha Crago, McGill University’s vice-principal of research and innovation, and Paul Davidson, president of Universities Canada – during an Economic Club of Canada event today. Shoichet, who holds a University Professor designation in U of T’s Faculty of Applied Science & Engineering, noted “things are really happening” in cities like Toronto and Montreal, which have both seen huge investments by Silicon Valley heavyweights and multinationals in recent years. However, she cautioned the current tech boom – much of it focused on artificial intelligence and its myriad applications, from medicine to transportation – wouldn’t have happened without strategic government investments in fundamental research decades ago. “It’s really important to recognize that research is at the root of innovation and commercialization,” Shoichet said during the lunch-time panel discussion. All three participants in the event, titled “Research, Innovation & the New Economy,” lauded the federal government for launching a federal panel in 2016, led by U of T President Emeritus Dr. David Naylor, to review how basic science is funded in this country, and for responding to its findings with significant investments in fundamental research in its most recent budget. Davidson, for his part, said visits to campuses of Universities Canada’s 96 member institutions left him with the impression that serious progress is being made. In particular, he cited growing efforts to foster collaboration between universities and business, as well as between universities themselves, through vehicles like the federal government’s supercluster initiative. He also noted Canada is making progress when it comes to promoting equality, diversity and inclusion throughout the country’s higher education system. Yet, despite the changes, the panelists stressed the need for Canada to continue improving the country’s research and commercialization infrastructure, while simultaneously working to instil a culture of innovation among Canadians. Crago, one of nine members on Canada’s Fundamental Science Review panel, emphasized the importance of continuing to fund young researchers in future budgets. She added Canada could also use more of a risk-taking culture like the one found in Israel, which has built one of the most successful tech sectors outside of Silicon Valley. Shoichet, meantime, suggested there is a need for more research and development jobs in Canada, particularly in key sectors like pharmaceuticals. There was also a lengthy discussion about the best way for universities to work with both giant multinationals and small- and medium-sized businesses and startups. One audience member – OCAD University President Sara Diamond – suggested Canada could do a better job at leveraging Canada’s strengths in fields like design, as well as arts and humanities more generally, to create an innovation sector driven by more than just pure science. Agreeing, Crago pointed to the video game sector in Montreal, which is anchored by firms like France’s Ubisoft. Davidson concluded the discussion with a warning about complacency. He cited a 2017 survey by the Pew Research Centre that found nearly 60 per cent of Republican Party supporters believed U.S. colleges and universities were having a negative impact on America. Just think of what these institutions have done for a country like the U.S., in terms of knowledge and innovation, over the past 70 years, Davidson said.